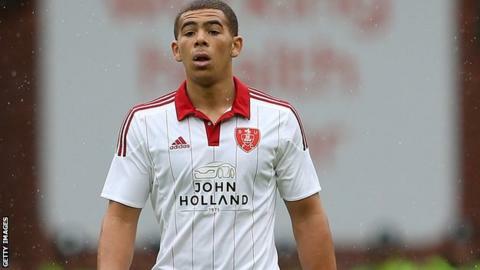 Che Adams struck a brace as Sheffield United picked up their first win of the season at the expense of Chesterfield. Adams's first came as he smashed home the rebound from close range after Conor Sammon's shot had been saved. He then combined well with Sammon before calmly slotting an effort into the bottom corner to double the lead. Sammon had a goal disallowed and Billy Sharp saw an effort brilliantly saved, while a Daniel Jones free-kick hit the woodwork for the visitors. The result saw the Blades climb off the bottom of League One and join Chesterfield in mid-table. Match ends, Sheffield United 2, Chesterfield 0. Second Half ends, Sheffield United 2, Chesterfield 0. Martyn Woolford (Sheffield United) wins a free kick on the right wing. Gboly Ariyibi (Chesterfield) wins a free kick on the right wing. Substitution, Chesterfield. Charlie Raglan replaces Drew Talbot. Substitution, Chesterfield. Armand Gnanduillet replaces Dan Gardner. Attempt missed. Daniel Jones (Chesterfield) left footed shot from outside the box is too high from a direct free kick. Jay O'Shea (Chesterfield) wins a free kick in the attacking half. Corner, Chesterfield. Conceded by Martyn Woolford. Attempt blocked. Gboly Ariyibi (Chesterfield) right footed shot from the right side of the box is blocked. Chris Basham (Sheffield United) is shown the yellow card. Attempt missed. Martyn Woolford (Sheffield United) right footed shot from outside the box is too high. (Chesterfield) wins a free kick in the defensive half. Attempt blocked. Chris Basham (Sheffield United) header from the centre of the box is blocked. Attempt saved. Billy Sharp (Sheffield United) left footed shot from the left side of the box is saved in the bottom right corner. Daniel Jones (Chesterfield) hits the bar with a left footed shot from outside the box from a direct free kick. Corner, Chesterfield. Conceded by David Edgar. Substitution, Chesterfield. Gboly Ariyibi replaces Oliver Banks.